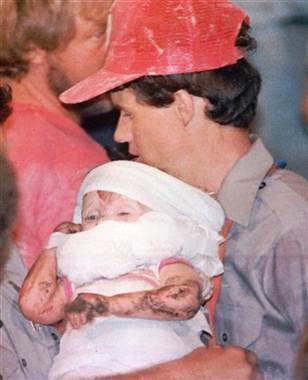 Remember watching Baby Jessica's harrowing rescue from an eight-inch well back in 1987? For neary three days, it was all over TV -- especially then-fledgling network CNN, which had round-the-clock coverage of the 18-month-old's ordeal. A Pew Research Center project found that Jessica's rescue drew more worldwide media coverage than any other event, with the exception of Princess Diana's death. Jessica McClure turned 25 on Saturday, making her eligible to receive the 800-thousand-dollar trust fund set up by well-wishers. If you haven't watched the footage in a while, here it is. Get ready for goosebumps. No wonder they called her "everybody's baby."